Happy Valentine’s Day…..Can’t Help Falling In Love…. Love is sweet, but our Valentine’s Day Special is sweeter! Valentine’s Day is the day to show the special people in your life how much they mean to you, and what better way than with our Valentine’s Day Special. 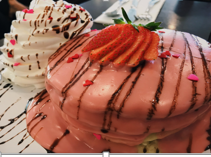 Treat your special someone to our Strawberry Vanilla Milkshake Pancakes: three white chocolate chip pancakes with our strawberry vanilla sauce, topped with a chocolate syrup drizzle, sprinkles and a strawberry with a side of our light whipped cream. We put our hearts into this special which makes it perfect for the person who holds your heart. Keep in mind that we will be announcing the winners for our Dinner for Two Contest on February 15th ; so tag us on your picture with your special someone and use the hashtag #HeartMyValentineENT to get a chance to win a date night for two here at Eggs ‘n Things! This amazing dessert will be served on 02.13.18-02.15.18.